“You asked me if the abstract was obfuscating reality and I said no because the abstract is as valid as the mundane” – and both are extremely valid in the filmic world of Luke Fowler. The quote comes from musician Xentos “Fray Bentos” Jones, the central but consistently absent subject of Luke Fowler’s 2003 film The Way Out, made in collaboration with Kosten Koper. 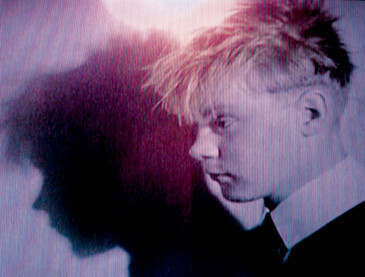 Fowler’s statement says a lot about the form and content of much of Fowler’s work, which combines archival and new material in ways that are visually evocative of avant-garde, structuralist and art films, to convey something of the personal, creative and political dynamics of a range of countercultural figures and movements. The young Scottish artist, who won the inaugural Jarman award for artist-filmmakers in 2008, creates films about people who exist on the margins and whose exile may be self-imposed just as it may be the result of a rejection by society. While the backbone of the traditional feature film or documentary genres may be the story, the heart of Fowler’s films is constituted by something altogether more ungraspable and sublime and on which his storytelling is predicated: people themselves with all their inherent complexities and contradictions. Fowler explores lives and beliefs, avoiding any instrumental use of his subjects and without succumbing to the shortcomings of representation and without doing violence to his subject. Citing radical and avant-garde filmmakers such as Lindsay Anderson and Hollis Frampton as key influences, Fowler’s films clearly communicate political and humanist messages through visuals that incorporate layered sequences, rich textures and unexpected rhythms. The Way Out recombines material from a variety of sources: new and found footage, including Jones’s own 8mm films, interviews and theatrical scenes scripted by Fowler. The resulting bricolage tells the story of one of the founding members of the band The Homosexuals and a prolific recording artist releasing up to two albums a week under different pseudonyms, Jones emerges as a maverick escapologist of the avant-garde music and culture industry. He is a slippery and antagonistic trickster who eludes any fixed identification or capture by a given system, and who also refused to take part in Fowler’s project. Colluding with its hero’s agenda through a wry deployment of emotion, humour and high camp, The Way Out is a faultlessly performative embodiment of its elusive protagonist. The film baffles with its multiplicity of viewpoints and contradictory histories, which range from spoof documentary-style interviews to angry diatribes and arty performances, to the extent that one American critic went so far as to question the very reality of its central figure. Sound plays a crucial role in Fowler’s films, on the level of both content – Jones’s output in The Way out or Cornelius Cardew’s experimental Scratch Orchestra, which is the focus of Pilgrimage from Scattered Points (2006) – and form. A frequent collaborator with composers and sound artists, the artist incorporates field recordings in his work, unearths archival tapes to form a key component of his storytelling, and occasionally exploits the affect of sound to striking sensory ends. 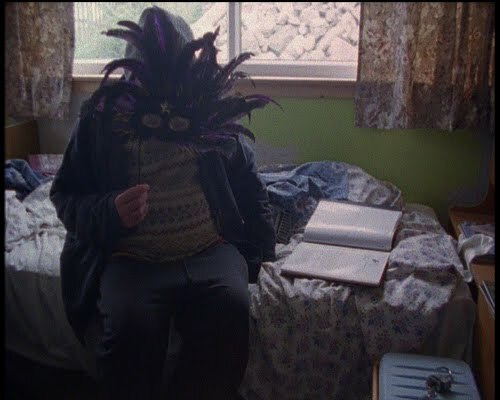 Bogman Palmjaguar (2007) is a poignant and persuasive film about the injustices of contemporary psychiatric practice, as well as being a portrait of the Flow Country, a remote area of rare blanket bog and wetland in northern Scotland. A trained conservationist whose writings about the natural habitats in the Flow Country possess a touching poetic beauty, Bogman Palmjaguar is also a certified paranoid schizophrenic. Palmjaguar is currently fighting a legal battle against this diagnosis, and the film features discussions between him and psychiatrist Leon Redler, a colleague of the late RD Laing, as well as an intriguing audiovisual portrait of the boglands. The intimate details of Palmjaguar’s life presented in the film are publicly available on his website, Wild Outlaws of Paradise, itself a poignant indictment of the mental health system and its inability to deal simultaneously with brilliance and illness. Nevertheless, questions about the possible instrumentalisation of a story like Palmjaguar’s nag at those sensitive to the dangers of exploitation that hover around documentary filmmaking. Fowler often includes his own voice and figure in his work, a subtle presence that might mitigate against possible accusations of abuse, if it is taken as evidence that the work results from a sustained relationship that stands to benefit both the protagonist and filmmaker. Fowler has stressed the importance for him of the social aspect of filmmaking and the relationships that form as a result of collaboration. He is a dynamic force in alternative modes of cultural production, in particular through the activities of Shadazz, the independent record label he founded in 2000 and which he describes as simply “an outlet for people being creative in electronic music”. As producer for the label he seems committed to nurturing a community of artists and musician and to the circulation of film and music, something that stems from his understanding that the paucity of outlets and poor means of production have long threatened the existence of experimental filmmaking groups and cooperatives. In both its visual style and approach to storytelling, Fowler’s work demonstrates a persistent drive against heavy-handed and systematic ordering and classifying. A firm adherent to American avant-garde filmmaker Hollis Frampton’s belief that arranging images into a narrative sequence is only one of many possible solutions, he has also asserted that he is attracted to features of “ungraspable complexity” conveyed by Frampton’s work. The act of grappling with the ineffable truths and irresolvable contradictions of human existence is central to Fowler’s first full-length film, What you See is Where You’re At (2001). The work looks at the five years of the Philadelphia Association at Kingsley Hall in Bow, east London. Set up in 1965 by pioneering psychiatrist RD Laing, the Philadelphia Association was an experiment intended to develop new methods for treating mental illness. Life at Kingsley Hall involved an unprecedented degree of autonomy for people with mental problems to accept or decline treatment. Psychoses were allowed to manifest themselves without the imposition of restraining or drug therapies. Fowler’s film borrows heavily from Peter Robinson’s 1972 documentary about the community at Kingsley Hall and combines it with new material to produce a portrait of a time and place whose daring and innovative approach is still pertinent today. The representation of the self, authenticity and identity are fundamental issues in Fowler’s films. Because of their multi-layered look and content, they enable an ongoing process of discovery for the viewer and, presumably, for the artist. The experience of watching one of Fowler’s films is akin to the process getting to know someone, with all its attendant paradoxes, hiatuses and leaps of faith. In terms of technique, a work’s formal register might swing from the meditative to the ecstatic, with varying temporalities evoking a slow curious eye or a manic epiphany. For all their complexity, there remains a paradox of clarity in Fowler’s works: despite – or perhaps thanks to – the multiplicity of styles and rhythms and the diversity of material sources and points of view, they give off an impression of transparency that hints at the possibility of getting to the core of their subject. Fowler is not overly concerned with the apparatus of art gallery installations for his films, and has stated that, if given the choice, he would rather show them in cinemas. A notable exception is the recent Composition for flutter screen (2008), the result of a collaboration with Japanese artist Toshiya Tsunoda. The installation marks a departure from Fowler’s previous practice by developing and expanding moving image into a complex sculptural installation. His most elusive work to date, it is composed of a 16mm film showing fixed shots that include a moth trapped in someone’s fingers and the meniscus on a glass of water. These are projected onto a handmade screen that is submitted to a series of ‘interventions’ including the amplified sound of a wire running across the screen, the movement of fans agitating it and the interference of lights cutting into the projections space, which together ask viewers to reconsider their cinematic experience. These intrusions lend the work an affecting physicality and like his films, hint at an autonomous presence or ghost inhabiting Fowler’s work. This entry was posted on October 12, 2009 by ellendw.